Everyone is hearing about the interest rates rising but it is not easy to understand the direct effect on you when buying a home. This graph gives you an idea of what happens to your purchasing power when the interest rates rise. 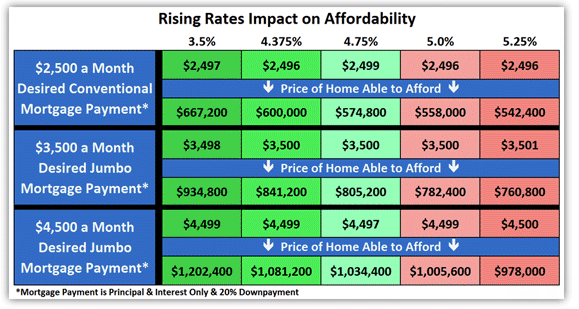 This shows why NOW is a good time to buy before the rates increase MORE! To view up-to-date Mortgage Rates and to learn about the different Purchasing and Refinancing Programs that are available I recommend you contact David Bowers directly. Our preferred lender is Kai Tubberville and we are happy to make an introduction or have him contact you directly with more information. He will be able to provide you with today's mortgage rate, financing options, pre-qualify you for a home loan, and more. *Enclosed information is deemed reliable, but is not guaranteed.